The Customer Experience (CX) movement got its start around the year 2000, then really took off about five years later. CustomerThink published the industry’s first global CX study in 2006 and has been researching best practices since then. Executive Summary: Top five conclusions about what differentiates Winning CX initiatives, to help CX leaders make better decisions. What is Customer Experience Management (CXM)? 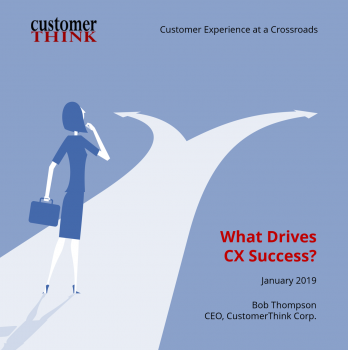 : CX leaders have widely varying opinions about whether, and how, CXM includes products and pricing, and how it relates to other terms like Customer Success Management and Voice of Customer. Customer Experience Strategy: This section defines what it means to “win” at CXM, and finds only one of three strategy paradigms has a meaningful impact on success. Current State of CXM: Most CX initiatives are focused on just one thing — and it’s not a differentiator — while Winners break away from the pack with more attention on emotion, non-survey feedback, and custom metrics. Practices That Differentiate Winning CX Initiatives: Of eight major CXM practices studied, five were found to be differentiators for Winners. Enabling Talent and Technology: Winners invest more in three key CX skills and have better technology to support customer listening and engagement. In short, this study provides a sorely needed roadmap of the critical decisions that CX leaders must make to deliver loyalty-building experiences that also create the value business executives demand. The report may be purchased online, and will be delivered in PDF format to the buyer’s email address. Questions? Please contact [email protected] for assistance.